Clyde was my eldest bunny. I envisioned him to be the ring bearer at my wedding. I have foreseen him as my baby’s first pet and playmate. Unfortunately, he passed away a year ago. Apparently, it has been a long stretch of sorrow and acceptance. Sadness, all this time, cannot help me pin down the right words to actually tell his story. I tried to, a couple of times, but it all went down to me shedding tears like it was his last day with us again. Clyde was part of our “We’re Expecting” announcement to our friends. Unfortunately, he wasn’t able to meet his tiny human. It was January 2012 when the then-boyfriend now-husband and I decided to get a pet. We did not want a dog nor a cat, but something just as cute yet not so usual, so we went on looking for a rabbit instead. We were supposed to get a black bunny with a tiny white dot somewhere in its body. We found one with a spot on its nose! But there was another bunny which kept following to wherever we point our fingers to, we just had to get him as well! This bunny had round blue eyes, which was something different from all other white bunnies out there (with scary red eyes). We named them Bunnie and Clyde. Bunnie passed away just a week after we got her. We assumed she was already sick by the time we got her as she was very fragile and was already refraining to eat. Clyde from then on became our only bunny child. He was spoiled. He loved getting a lot of attention. He loved bananas, strawberries, and veggies all to himself. He loved playing and lurking around the house. He loved being cradled like a baby. He loved grooming and getting baths every now and then (we had to give him baths, like twice a year, to smoothen and remove discolored areas of his coat). He loved trips to the park. He loved dressing up in costumes. He loved celebrating birthdays. He loved his photos being taken. He loved welcoming guests and being petted. Rabbits are often misunderstood, but it was easy to figure out Clyde’s moods. Our family knew Clyde loved us. He’d jump off his home when we arrive at the doorstep. He raises his head for pats, he struggles climbing up the stairs only to struggle again getting up to bed to wake us up on weekend mornings. He follows us in circles, then begs for treats. He loves lying around, listening to our stories, or even school stuff when my sister reviews in the wee hours of the morning. Clyde would lick our hands, our faces, and even docks his face to my chest. Clyde was a furball of affection. We got him a wife a few years later since he has grown, uhm, horny. He got 3 wives, Quasha, Claudia, and Crumble. They were pretty rabbits. 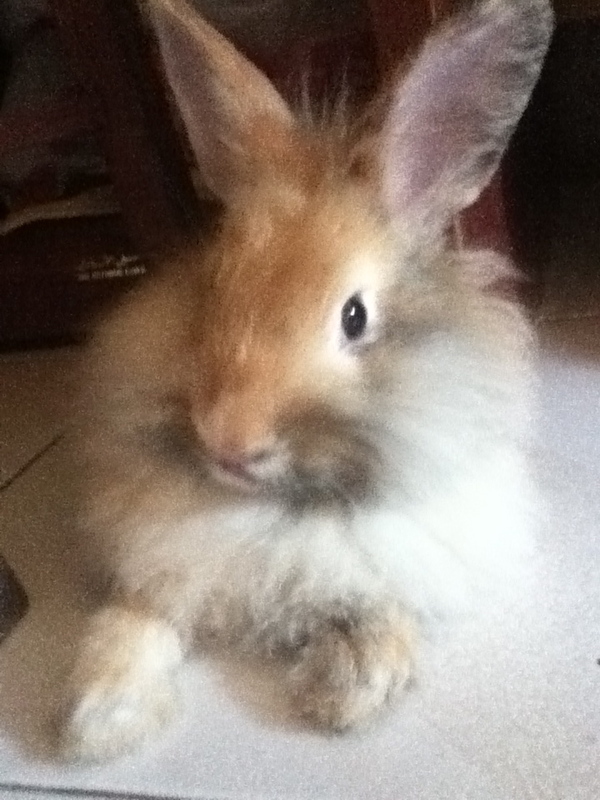 Quasha was same breed as Clyde, while Claudia and Crumble were part Lionhead part Angora. He got kids, some as white as him, some became a mix of white and brown, and white and grey. His every bunny baby was adorable. Clyde on his last birthday with us. He was not happy, his humans had more carrot cake than he did. Clyde was growing old, we knew that – his face has grown lines, he no longer runs like crazy when brought outside. We were supposed to have him castrated as rabbits tend to suffer sickness from their poop and pee in old age. Unfortunately, we weren’t able to get to that, Clyde broke down one night. He hasn’t been eating nor drinking. My parents have given him medicines, but he was still sick. I carried him in the car while we were on the way to the veterinarian. He was in pain, I knew, he buried his face to my side while I cradled him. My sister and I were crying and trembling on the way to the hospital. But Clyde was a fighter. He still wanted to stand and jump and binky. He struggled getting on his chubby toes, his body slammed unto the hospital table in his every attempt. It took a few times before the nurse attached the dextrose, his veins already collapsed. His eyes were already wide, his breathing was heavier, and his heartbeat was faster than normal. Clyde never felt so threatened like this before. But we had to leave him at the hospital overnight. We knew that was a bad idea, however we were compelled to, for we can not make him feel better at home too. I was so brokenhearted to see him with a dextrose in his paw, sealed in a cage and warmed with a spotlight. I wish I spent the night with him there, but in my head this was for his good. I was very very afraid, but I knew Clyde was a fighter. He’s a stubborn bunny – I just think of him at the hospital table trying to stand again – such a brave little baby. The next morning, we received the news. I didn’t know if he just provided some luck or something that day, but our family braved through traffic and number coding to finally lead Clyde to his own paradise. My grandfather picked out a very quiet area for him, where he could visit Clyde often when he farms and plant his vegetables. We laid Clyde in an area surrounded by greens – where his playful soul could play and jump and binky endlessly. He can feed on the grass too, when he’s famished and stay under trees when he gets tired. There are still days when I remember Clyde and cry. But maybe Clyde has already lived the best of his days on earth – a happy binky-ful and flop-sy bunny life. Or maybe Clyde found out there’s an even happier place where he’d have unlimited carrots, bananas, cabbage and strawberries, where every time is playtime and where he can binky, jump, and flop all he want. I miss Clyde everyday. There will never be a bunny as affectionate as my little bunny boy. I used to think days have their own way of turning things upside down and inside out. Interestingly, I never seen a week, a month, or a year that way. June is one of my favorite months. Birthdays are celebrated here and there, including the boyfriend’s. It’s when you celebrate Independence Day and get free train rides during rush hour. It’s when I allot all my hoarded vacation leaves at work so I could get myself to the beach. Summer’s last hurrah, yes. This time however, the week I thought would be of sheer bliss, turned out otherwise. Pardon me, I will have to overshare. My boyfriend and I caught The Fault in our Stars in cinemas. I rarely read nowadays since books are forbidden in our workplace but The Fault in our Stars didn’t prevent me in reading and bawling in my cubicle. The movie was how I expected it to be, nothing better compared to the book as some details were left out. I do however shed tears at the scene where Hazel and Isaac were to read their eulogies to Gus. I’m a sucker for beautiful words and I can only imagine how much beautiful yet painful it could be to offer them to one’s existence and absence. Well, at least I no longer gasped for breath in the theater like the girl who sat a seat apart from me. Mocha passed away. We spent several days in Palawan for the boyfriend’s birthday. Before we left, I spoke to our bunnies to behave and not cause headache to my parents. (Though I asked them to make cuter and paawa faces to my sister and parents whenever they want to play outside). We were on the way home from our Underground River trip when we received news that our little baby Mocha passed away that morning. My parents said she had weird bowel movements the day before and was acting drowsy. They thought it was kind of normal since Mocha has the tendency to be passive aggressive at times (you know, lady bunnies). My boyfriend and I cried on the way back to the hotel. Instead of trying out the night life in Puerto Princesa, we spent the night quietly. My iPod drowned. Yes, I cried over that because I get sentimental over photos and videos and memories and lists. Only then have I realized I have a percentage of my life stored in that little dummy thing. Plus, I have Mocha’s and all the other bunnies’ photos there too. My boyfriend and I got into a vehicular accident. I guess I wouldn’t have cried so much for the sake of the accident alone. Well, not until I got a glimpse of my burned leg. We were rushed to the nearest hospital for first aid. I kept tugging my boyfriend’s arm the entire time they were giving me first aid. I kept asking the nurse what is this and what is that they were applying. I can feel my legs sore then numb then sore again. I never really liked hospitals, mind you, so that was an extra bad memory again. I was on seven days sick leave as the doctors advised that I take rest. On those days, my boyfriend was the one in charge of cleaning the burned area. I cried every time. I bit on shirts and chomped on pillows just to let go of the sting and the pain. I was still a brave girl according to him. I would insist on doing normal things like walking around, playing with pets, and pulling my legs straight when sleeping. I guess I am pretty brave for someone who has low tolerance for pain. I’m no longer posting my leg’s photo because that would be crazy gross oversharing, but it’s already healing. I can still hardly believe that all happened within a week. Well, referring to bullets 2 and 4, the first and third one was just for some extra tear count. Small regrets though, wish I had been there when Mocha was having troubles. I usually have panic attacks so when I see her in a condition that bad, I would have called whoever or have already taken her to the vet. Also, I would have wanted to turn back time and play the fourth bullet incident in slow motion. However, I am charging this to experience. I will smile and sigh at my battle scars: “Gawd, I’m brave”.